This self teach guide has been designed to gradually steer you in a step by step manner around the software features needed to pass New CLAIT 2006 Unit 8 assessment. As you work through this book you are introduced to, and taught how to use, Microsoft Outlook, Outlook Express and Internet Explorer. Data files are available to download and have been designed to be used in conjunction with the exercises as you work through the book. 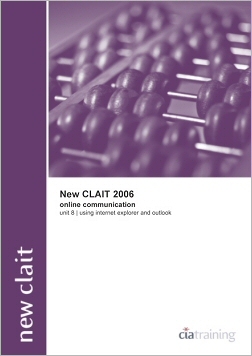 Titles of a similar nature are also available for the other New CLAIT 2006 units. Endorsed by OCR. This product is available in 8 different versions. Click the Buy Now button at the top or bottom of the page to select the version you would like to add to your shopping cart.